Excellent for use in athletics and occupational activities. Helps dampen vibration and shock often associated with repetitive motion. Provides warmth and comfortable uniform compression over the affected area. Holds the thumb and wrist in opposition to help relieve discomfort and prevent re-injury, while maintaining full finger dexterity. 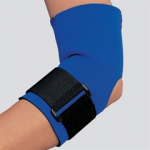 Good support for repetitive motion, overuse injuries.